Glimpse into Archie Shah’s day with WeddingSutra Favorites where she emerges a gorgeous bride. 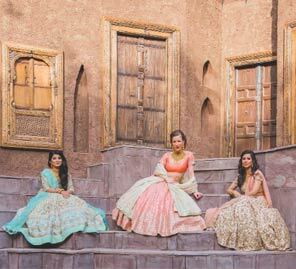 WeddingSutra’s most popular bridal initiative WeddingSutra On Location was held at one of Mumbai’s most striking properties, The Westin Mumbai Garden City. In the first of this three-part series, bride-to-be Archie Shah she blows life into her vision of the perfect bride and looks nothing less than a dream! Archie picked a lehenga in wine and paired the SVA By Sonam & Paras Modi creation with a gold choker by Azva. Exemplary of fine design and skilled craftsmanship, the piece elevated the entire look. 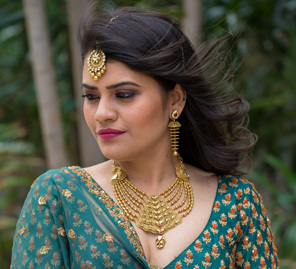 The bride-to-be decided to trust make up artist Minee Khanna entirely to create a look to complement her attire, using products by Lakmé Absolute. Hairstylist Disha Pamnani tied the whole look together with a pretty hairdo that paid attention to both, Archie’s modern style and a traditional aesthetic. Ensuring all her expressions and poses were captured artfully was Knotty Affair by Namit and Vipul. To prep Archie’s skin, makeup artist Minee Khanna began by applying the Lakmé Absolute Argan Oil Serum Foundation in Ivory Cream. She then set it with the Lakmé Absolute White Intense Wet and Dry Compact. Dimension to Archie’s eyes was created with the help of Lakmé Absolute Illuminating Eye Shadow Palette in French Rose. Using the Lakmé Absolute Forever Silk Eyeliner in Blacklast she darkened her eyes and then added a flush to her checks with the Lakmé Absolute Face Stylist Blush Duos in Rose Blush. The final touch resonated with the wine colored lehenga, the Lakmé Absolute Argan Oil Lip Color Mauve-It on her lips. Are you engaged and planning your wedding? 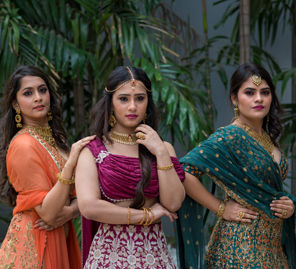 Would you like to be a part of WeddingSutra On Location*? Write to us at editor@weddingsutra.com with your name, link to your FB profile and wedding date. Selected winners will receive a complete ‘Bridal Wardrobe’ consultation on how to pick the wedding outfit that perfectly complements your body type and personality.